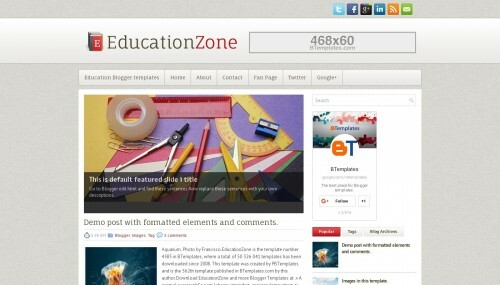 EducationZone is a free blogger template adapted from WordPress with 2 columns, responsive design, right sidebar, ads ready, footer columns, slider, social bookmarking icons, posts thumbnails, tabs, a background pattern and neutral colors. Excellent template for blogs about books, education or home and decoration. Very nice template for education sites. I really like your work of free giveaways.